How to Improve Your SEO Results using LSI Keywords? Everyone, in the SEO world, is talking about LSI keywords and their impact on the rankings of a website. Frankly, the topic has created quite a buzz among SEO professionals and other website owners as well. While many SEO professionals have already started utilizing the LSI keywords as a part of their SEO strategy, others have no idea about their significance whatsoever. For the latter category, we have decided to share our thoughts on LSI keywords and how one can use them to achieve significant results for his/her website. Before moving towards LSI keywords, let’s first understand, how these keywords actually came to existence. LSI keyword is a concept which has its roots in the 80’s computer technology, the Latent Semantic Indexing (LSI). The technology was developed to help a computer understand the overall context of a document by finding correlations between different phrases used in the document itself. It helps a computer to read and understand a text document in the same way a human does. How Do Search Engines Use the Concept of LSI? So, how do search engines use LSI to improve their search results? Basically, search engines have started to focus on understanding the overall context of a content to provide better and more accurate results to a user’s search queries. LSI helps a search engine to understand the exact meaning of your content by finding relations between different phrases (written in the document) with the target keywords. As a result, the search engine provides users with better results based on their queries. Now that you know what LSI is, let’s take a look at the LSI keywords. As per the official definition, LSI keywords are the words or phrases which are related to your target keywords. However, many people have started to misinterpret LSI keywords as synonyms too, which is not the case at all. 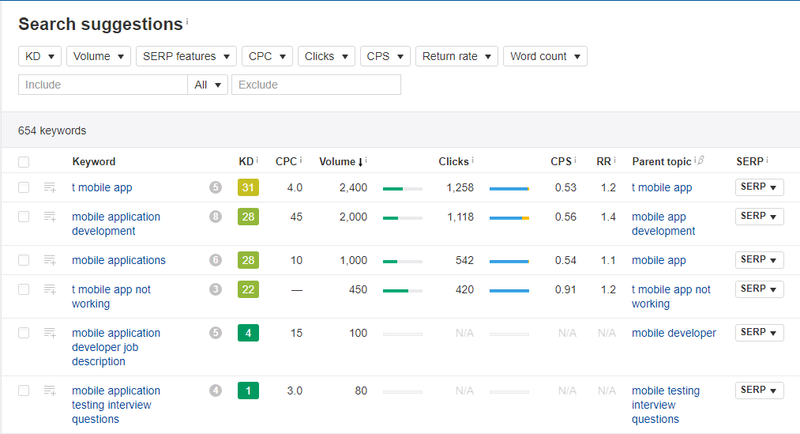 While LSI keywords could have a certain relationship to the target keyword, they never have the exact same meaning. If anything, LSI keywords are far away from synonyms. For instance, the keyword ‘games’ can have LSI keywords like ‘computer games’ or ‘outdoor games’, but the word ‘tournament’ does not fall under the category of LSI keywords. Since a word can have a variety of meanings, LSI keywords help the search engine to figure out your intent and the context of your content. For instance, if your target keyword is ‘Pie’, then there are two possible cases. You have written about the dessert ‘Pie’, and therefore your blog can include keywords like ‘apple’, ‘bluebery’, ‘chocolate’, ’banana’, etc., the different kinds of pie. You have written about the latest Android version ‘Pie’, and therefore your blog is more likely to have words like ‘Android’, ‘smartphones’, ‘Android Pie’, ‘Android 9.0’ etc., the words that relate to the Android version ‘Pie’. As a result, it becomes easier for the search engine to understand the context of your content, and eventually provide the user with highly accurate search results. Why do Search Engines Need LSI Keywords? For many years, keyword density was one of the major factors to influence the rankings of a web page. Keyword density is the percentage of the target keywords used in a blog to the total number of blogs. For instance, a blog with a word length of 1000 in which the target keyword appears 20 times, the keyword density would be 2. However, the strategy soon turned into a curse for the search engine as many website owners started to perform unnecessary ‘keyword stuffing’ with a sole purpose to increase the keyword density. Despite having all the target keywords, most of the web pages had completely irrelevant content. To overcome this scenario, Google decided to pay attention towards understanding the actual meaning of the content rather than relying on the keyword density. It is when LSI keywords came into the picture. Since LSI keywords help the search engine to understand the actual meaning of the content, using them in your content eventually increases the odds for your web page to rank higher on the Search Engine Result Page (SERP). Keyword density has become a thing of the past. So, if you are still relying on keyword stuffing to improve the rankings, you are wrong. Unnecessary keyword stuffing not only affects the rankings of your website but can also lead to a Google Penalty. So, avoid stuffing your web pages with target keywords and use LSI keywords instead. However, make sure to only add keywords which have a certain correlation to the target keyword as using irrelevant LSI keywords is also a bad SEO practice which can easily lower the rankings. Now, that you are familiar with the LSI keywords, let’s move towards the process of finding them. When it comes to finding LSI keywords, you can follow one of the following four approaches. Using the search engine itself is the easiest way to find a list of LSI keywords for your target keyword. Simply type down your target keyword into the search bar and wait for Google to drop down a list of related search queries. 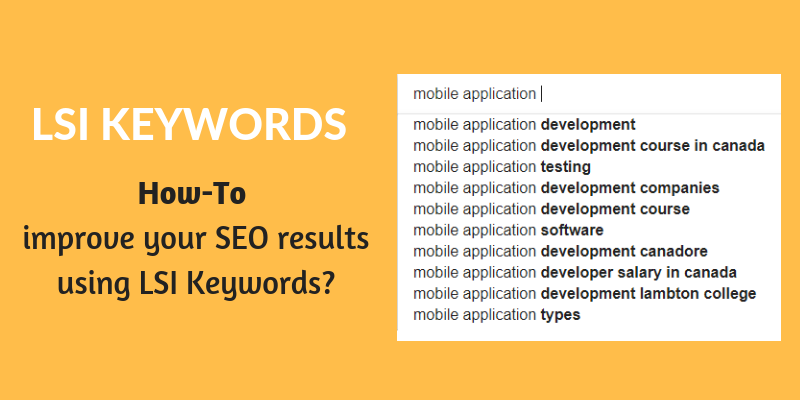 Here’s a list of LSI Keywords for ‘mobile application. 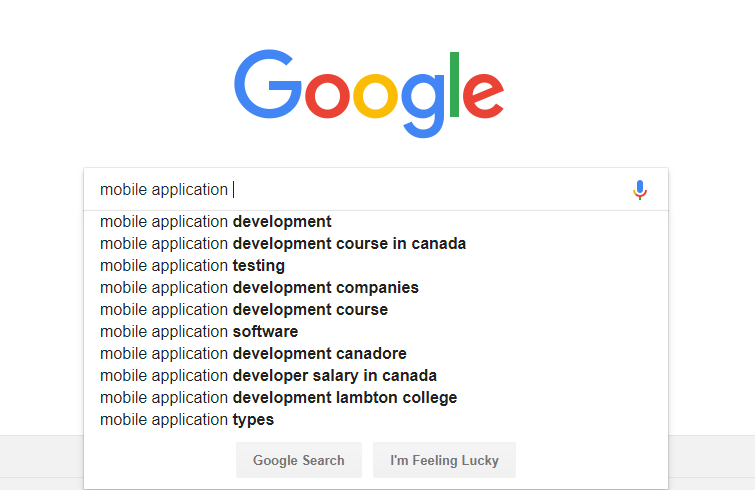 Here you can see that typing mobile application provides a variety of LSI keywords which you can scribble down in your content to make it easy for Google to understand its context. Similarly, you can also use the related searches section to find other LSI keywords for your search query. While you can use the Google Search option to find a list of LSI keywords, they provide an insight into the average search volume and competition of the keywords. Furthermore, the keywords generated via related search section can vary from location to location. Therefore, to find more accurate LSI keywords we recommend using tools like Google keyword planner. Google keyword planner is one of the most convenient tools using which you can find LSI keywords for a particular search query. If you already have a Google AdWord account, you can easily use the keyword planner under the tools section. Here’s how you can use the keyword planner to find a list of LSI keywords using keyword planner. First of all, click on the keyword planner tab under the tools section on the Google Adwords homepage. Click on the ‘Find New Keyword’ tab and type down the target keyword in the search bar. The keyword planner will generate a list of related keyword and sort them on the basis of the search volume, competition, and other similar factors. 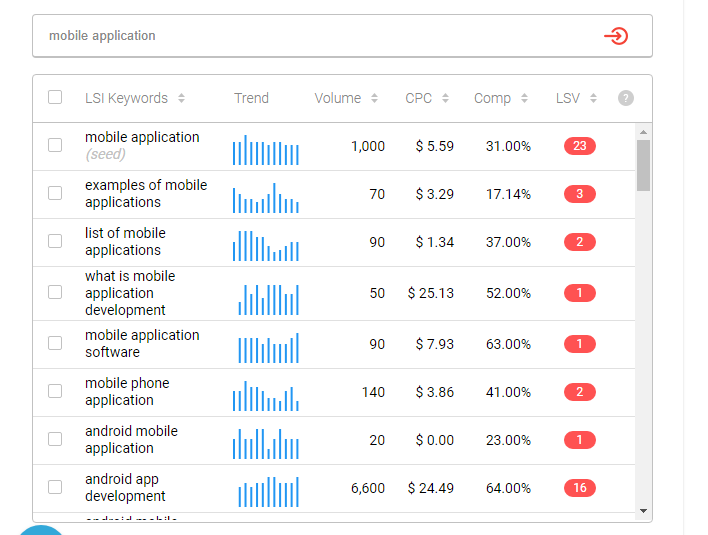 Here’s what happened when we entered the phrase ‘mobile application’ into the keyword planner. As you can see that using the keyword planner we can have a better insight into several factors like search volume and keyword competition. LSI graph is by far the most reliable LSI keyword generator in the market. The tool is specially designed to generate a complete list of Latent Semantic Indexing (LSI) keywords for your target keywords. We recommend using LSI graph once you have already generated a list of target keywords. Simply type down each target keyword and click on the generate button. The tool will automatically generate a list of LSI keywords for you. LSI graph has both free and paid versions. While the free version does provide you with a list of LSI keywords, it has certain limitations. For instance, you can only search LSI keywords for 20 phrases per day. However, the paid version can be used to generate LSI keywords for as many phrases as you want. Furthermore, the paid version also displays the result along with search volume, competition, CPC, and other factors. Here are the search results generated by the paid version for the same search query, i.e., mobile application. You can use other LSI keyword tools as well. Here are some of the alternatives of LSI Graph which generates the same results. Apart from keyword planner and LSI graph, several SEO tools like Ahref and SEMRush can be used to find LSI keywords for your target keywords. If you are using Ahref, use the search suggestion option under the keyword explorer tab. Similarly, if you are using SEMRush, click on the ‘Related Keywords’ tab and it will display a list of all the LSI keywords. These are a few methods to find LSI keywords for your target keywords. Once you have made a list of the most relevant LSI keywords, it is time to scatter them across your blog. However, there are a couple of things that you should remember while using LSI keywords in your content as their unnecessary use can degrade the content quality. How to Use LSI Keywords in Your Content? Finally, the much-awaiting question, how to use LSI keywords in your content? While you can use the above methods to find LSI keywords, it is crucial to use them wisely to improve the credibility of the content. First of all, understand the significance of your content and find the most relevant keywords which also have a considerable average monthly search (volume). Now, that you have made a complete list of the most relevant LSI keywords, scribble down them in your content in such a way that your content does not lose its meaning and looks natural at the same time. Since the main purpose of the LSI keywords is to make the search engine understand the meaning and context of your content, using irrelevant LSI keywords is not a good practice. So, try to use the most relevant LSI keywords that suit your business goals and also help the search engine to put your website in front of the right audience. What are the Benefits of LSI Keywords for Your Website? Using LSI keywords benefits your business in different ways. Here are some of the proven benefits of using LSI keywords. Since Google and other search engines focus on providing users with the most accurate content, using LSI keywords in your content will eventually improve the rankings of your website. LSI keywords explain the overall context of your content which means the quality and credibility of your content ultimately improves. A better content quality will encourage a user to spend more time on your website, i.e., better user engagement. Speaking of better user engagement, a quality content also lowers the bounce rate of your website which eventually improves the rankings of your website on Search Engine Result Page (SERP). Using LSI keywords in your content is one of the best SEO practices to improve the rankings of your website. It helps your website to reach your target customers and build better customer relations by providing them with quality content. Furthermore, finding and implementing LSI keywords is one of the easiest tasks which can be performed by everyone, even people with little or no SEO knowledge. So, if you want to achieve significant results for your website, start using the LSI keywords as a part of your SEO strategy.